Nefertaris tomb has the best preserved and most eloquent paintings of any Egyptian burial site: it is the Sistine Chapel of Egyptian history, so to speak. 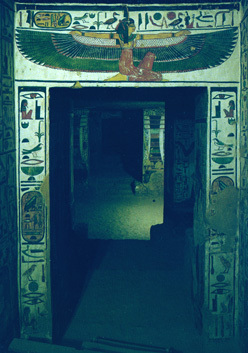 The paintings on the tomb walls depict Nefertari's journey after death to the afterlife, guided by various guardian-spirits and deities, including Isis, Hathor, and Osiris. The tomb was discovered in 1904, and quickly became world famous. You will see the reason why if you take the tour below. Nefertari was one of several Queens of Rameses II, 1290-1224BC. [Her name is sometimes spelled Nofretari, and she is NOT the same person as the more famous Queen Nefertiti, with whom she is sometimes confused.] Nefertaris name means the most beautiful. The elaborate tomb for her was built by Rameses II near Thebes, in the royal burial grounds in Egypt. What follows is a virtual journey into some of the meanings of Nefertaris tomb, her house of eternity. You will be led by a quirky guide with a flashlight to highlight the stunning graphics in the tomb, which hold the Egyptian key to the meaning of the afterlife. This virtual tour---I guarantee you---will be a little different from the others out there on the Web. The real tomb is now closed to the general public, due to the damage that viewers breath (their humidity) brought to the paintings. The tomb may also be toured by a visit to your local library; see the list of print sources at the end of this tour. Note: the set of images used in this tour is just a small selection, fair use we hope, of the thousands of images in the tomb that have been reproduced over the years in various media. The best are by the photographer Ekkehart Ritter, of Vienna, which were originally published in a book no longer in print. The images are not discussed in literal order, but rather are organized by theme and motif: you descend to deeper and deeper meanings. As you make the descent, watch your spirit-level. The texts and interpretations accompanying the images are mine, though Ive drawn from a number of sources, especially Goedicke. (For sources used, see the table of contents below.) For the mistakes that no doubt are here (Im no Egypt expert, only what used to be called an amateur) I apologize; I hope what insights there are may be a counterbalance.